Tea and Talk for Two: Breakthrough! 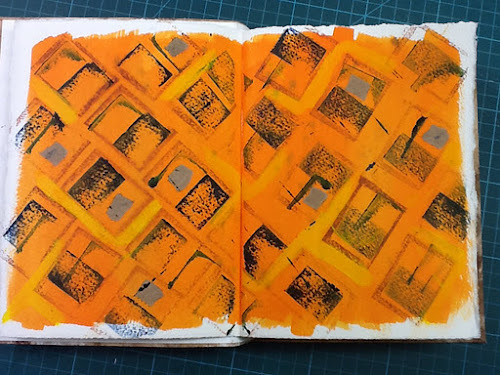 We have talked before ( whether on or off this blog I forget) about sketchbooks and I have long said that I keep a journal for quilting, which has notes, inspirational cuttings and ink doodles in. I have also said that I admire, like to look at and have decided not to pursue making beautiful artists journals with perfect pages. But when it comes to messy painted journals, the type artists make to play and experiment and warm up in, I am firmly on the fence. Love to see them, academically understand how they benefit a process, can never quite seem to do them myself. I mean, I can splash and stamp paint. Who can't? But I hate the results. They never seem to link to anything textiley and rather than being inspired by by past efforts I have been disgruntled at the wasted time and products. We have also talked about struggling to establish an individual recognisable style of our own. So, with all that in the background I went off to the Knit and Stitch show on Saturday. I will blog about that separately over on my own blog but lest just say that save for one exhibit the gallery was manifestly uninspiring this year. 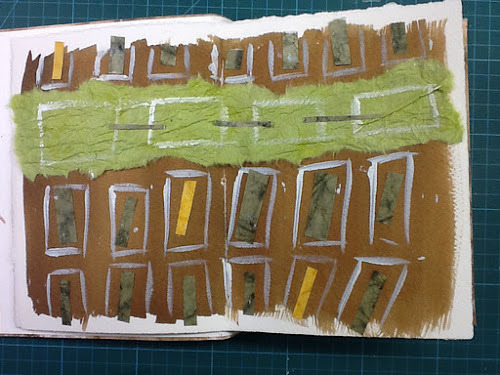 Maybe because of that, what stuck in my mind as I left was messy play sketchbooking. 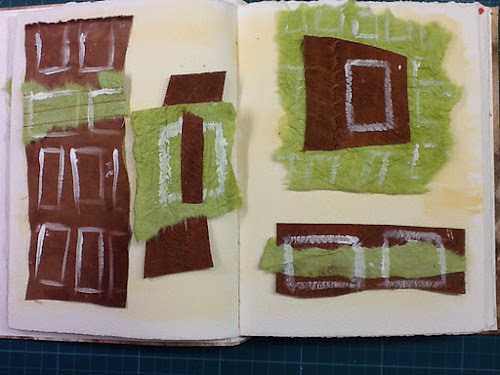 I had leafed through Susan Chapmans book and watched her create more in the Active Studio area. I had shown Dennis ( yes he came!) work that Ruth Isset had on her work table at the Art Van Go stall ( and was highly amused to watch him instinctively back away from ' the mess', bless him). 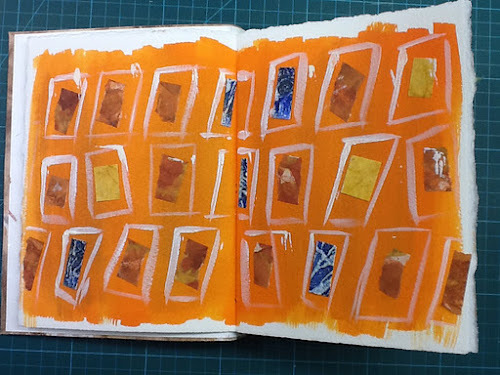 I had looked at Julia Tristons new book, which I decided not to buy because much of it was what she had taught me on the City and Guilds course, but I enjoyed flipping through it and seeing again the sketchbook she made including stamped pages based on her elephant theme. Another exhibit was Mary Sleigh who unaccountably showed all her collection of African artifacts and none of her ownwork inspired by them.But nevertheless, that evening at home it made me revist her books which include inspiring sketchbooks of paper collages based on african insiprations. That was Saturday. On Sunday I went out to a garden centre to get a Christmas tree and was kind of contemplating whether I could try again with a messy sketchbook and doing the usual debate/ mental excuse about not having quite the right book. I came home to find a package in the letterbox from Nikki Wheeler. I have no idea why it was there right then as there was no postal delivery on a Sunday and the package fit in the box so no reason it would have been delivered to a neighbour. In the package was a beautiful hand bound sketchbook with just the perfect paper for what I had in mind. And given that you set the group up to play with no expectations it seemed the perfect permission to set to. So I did just one page. 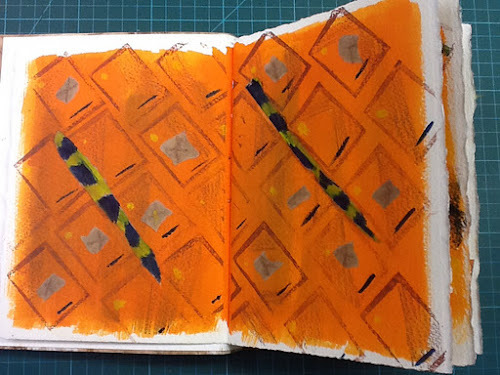 It is inspred by a photo in the Passages book by Carol Beckwith and Angela Fisher of body art at a Ghanaian inititiaton ceremony and it is clear to me at least that thoughts about kuba cloth were still there in my subconscious. I even took some of it into fabric and barkcloth just to see how the household emulsion which I was using (hey, it was to hand and we have lots of it!) behaved on those substrates. I am conscious as I blog this that in the past I might have dismissed the pages above as unsucessful. I think a lot of it is attitude and the fact that I am currently inspired by tribal body painting seems to free me up because I am working with a source that is not refined and so my work need not be either at this sketchbook stage. That was the first part of the breakthrough. The second came when I showed the pages to Dennis. He often has trouble visualising things until they are completed ( which is why he is totally suprised how our house rennovation is turning out!) so I asked him if he saw anything but ' mess' , (his term for any process involving paint!) He said that he could see I was developing designs and, said, for example, " that is your repeating symbol"
Huh? What is? He meant the thin line in the second verticle sample in the last photo. I was perplexed. I could not think of ever using a shape like that as a symbol. So I got out of the cupboard a pile of small quilts I had stashed at random. Journal quilts, spare Twelve quilts, fabric sketches. That shape appeared in in one form or another in every single one of the twenty one quilts! Sometimes more obviously, sometimes less. But there it was in all twenty one! And when I blogged on the Twelve by Twelve blog about contemplating a common design element in my 20/12 quilts that was one thing I had in mind. And I had NO IDEA that I did that. Dennis was amazed I did not know. He thought I did that deliberately. I tell you. it gave me goosebumps. Firstly to learn that, without me even realising, the work I thought was totally disparate had apparently a sign that it was made from the same hand. And secondly that I have a husband who knows my art ( and therefore me) better than I know myself. Of course, with my talent for complication, I now have to ponder how being conscious about that design element might affect my work! I thought you would want to know and share the goosebumps with me! That is a pretty amazing story. I'm very excited to see where you go with this. When I did my 12x12 "stats" at the end of the theme series and the color series, there were several things (both techniques and motifs) that I used regularly. Some surprised me. I was also surprised that some things I thought I did use regularly did not actually show up as often as I thought they had. It make me think that the art almost has a mind of its own.